July | 2013 | Crystal Water Villas Blog - Lake of the Ozarks! We’re always looking for interesting articles written about the Lake of the Ozarks. Little tidbits and facts that give you more insight into why we (and much of America) find the lake to be such a perfect vacation destination. – How many boaters and vacationers does the big lake attract? The Water Patrol, a division of the Missouri Highway Patrol, said the lake area is the equivalent of the third-largest city in the state on holiday weekends. – There are more than 25,000 boat docks on the 54,000-acre lake, more than on any other Missouri reservoir. 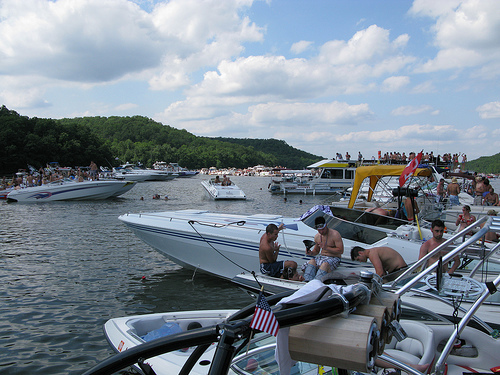 – Lake of the Ozarks was named America’s Boating Capital by Boating Magazine in an article this year. “Ask most boat builders where their top five markets are, and Lake of the Ozarks will be on that list. – So why is Lake of the Ozarks so popular with boaters? It starts with its size. Covering 54,000 acres and 92 miles from end to end, it offers plenty of options for boaters. If you want to boat into the middle of the action, you can stay in the first 40 miles of the lake. But if you want a more peaceful experience, you can find less traffic from mid-lake to the Warsaw area. If you’re heading to the lake this month, next month, or this fall, be sure to check out Adventure Boat Rentals for all of your boat rental needs! It’s true. You don’t need to head to the Caribbean to try the zesty, spicy, kick-in-your mouth flavors of Jamaica. 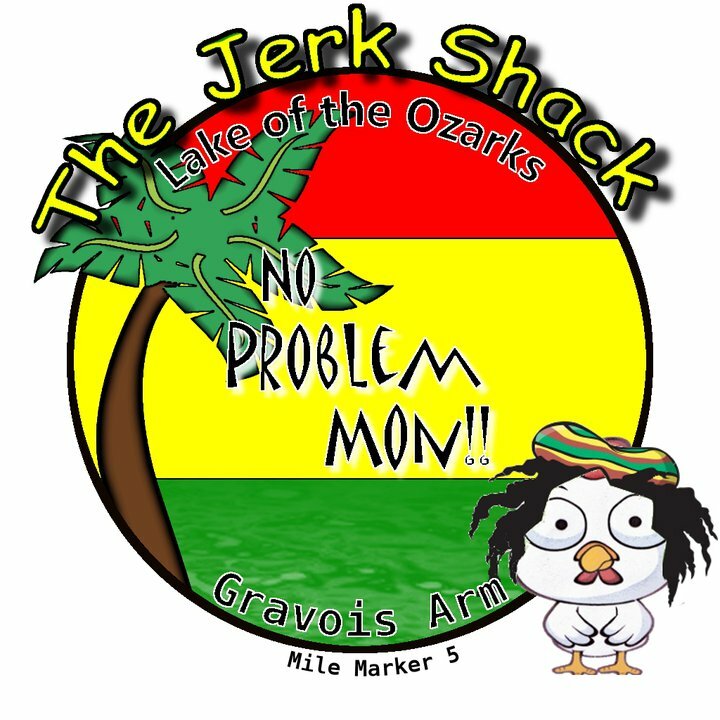 During your stay with us at the Lake of the Ozarks, head to Gravois Mills (near mile marker 5) to try out The Jerk Shack! If this is your first Jamaican cuisine experience, be sure to start with the fried plantains. Crispy, crunchy goodness! For the main dish, there’s plenty of meats to choose from, all cooked with a jerk seasoning that will have your tastebuds craving for more. Their famous Jerk Chicken and Dreadlock Jerk Pork are two entrees we’d highly recommend. Even though the food and drinks are the star of the show, no restaurant at the Lake of the Ozarks makes the top of our list without having a gorgeous view of the lake. Take a look at this photo below to see the view The Jerk Shack has in store. Have you been itching for a round or two of golf this week? Here’s a tip from Lake of the Ozarks West Chamber of Commerce that can save you money! Save up to 50% on Indian Rock Golf this week! Check it out at this website and set your tee time. Long ago Osage Indian tribes lived in this remote area. These densely wooded rolling hills were one of their principal meeting places. Numerous “thong trees” (saplings bent to the ground and tied down), found throughout Indian Rock, were used by the Osage Indians as markers to show the way to various destinations. While playing golf at Indian Rock it’s not hard to imagine the sheer beauty and serenity that early natives must have experienced when they discovered these picturesque grounds. Whether you’re lovebirds newly in love or a couple that’s been together for decades, a romantic dinner is a must for any trip to the Lake of the Ozarks. With a charming ambiance, delicious food, and a robust wine list, we highly recommend you make reservations at a local restaurant called The Duck. Opened in 1985, their distinctive lakefront dining experience features both traditional favorites and innovative creations prepared with the freshest ingredients by their culinary staff. A fun little tidbit: They initially opened as small cafe, called The Lucky Duck Waterfront Cafe. Click here to read about the story behind their name. Begin your dinner with perfectly Smoked Trout or their Cheese & Meat Board that will you get tastebuds anxious for the main dish. Feel free to take a sneak peek at their Dinner menu, lighter options, and of course, their wine list. 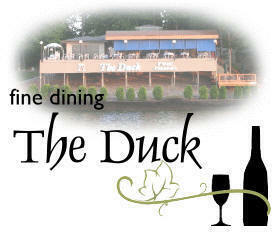 The Ducks is located in Lake Ozark off of the Horseshoe Bend. Their address is 67 Cherokee Court, Lake Ozark, Missouri 65049. To make a reservation, call 573.365.9973. Are you craving Mexican food and an unforgettable view? Sunrise Cantina, located in Osage Beach, is one of the best places to go to get a panoramic view of the lake. Open for lunch and dinner, this lakeside cantina offers an abundant menu, from classic burritos to lobster and shrimp tacos for those with a more adventurous palate. They also have a full-serviced bar, with a Happy Hour from 3-6pm, Tuesday through Friday. Sunrise Cantina is located at 264 Sunset Hill Drive in Sunrise Beach, Missouri. There are a few different philosophies when it comes to taking a vacation. One is to kick back and relax. The other is to be on the go and to make the trip a memorable one. Sure, you can have it both ways. For our guests with adventure in their blood, parasailing is one activity you should tackle during your time at the Lake of the Ozarks. Paradise Parasail was established on Ft. Myers Beach in 1982. They were the first on the beach and voted “Best on the Beach” by Ft. Myers Beach Bulletin newspaper readers. With over 30 years of combined experience, they are the parasailing specialists! Located near Bagnell Dam, Paradise Parasail will ensure you have an experience you won’t forget. Give them a call at 573-365-6757 to book your parasailing adventure. Also, be sure to check them out on Facebook. Whether you’re an accomplished sommelier or new to the world of wine, there’s nothing better than tasting wine straight form the source. Everything from tastings to tours, remember you don’t need to head to California to get a rich introduction to the all types of wine. Here are five wineries in the Lake of the Ozarks area that are a must for a romantic weekend getaway or a vacation with friends. Seven Springs Winery: Seven Springs Winery and Vineyards sits atop 160 acres of rolling Missouri foothills between Camdenton and Osage Beach. The winery is less than a 10 minute drive from either location. The covered porch and patio area are ideal for enjoying a glass of wine and admiring the beautiful views. Shawnee Bluff Winery: Shawnee Bluff Winery offers wine by the bottle or by the glass. We also offer wine tastings in a beautiful setting with gorgeous views of the Lake of the Ozarks. We are located on Bagnell Dam Boulevard in Lake Ozark, situated atop the bluff with a 14 mile incredible, panoramic view of Lake of the Ozarks. Originally renovated in 2011, we now have added new decks to enjoy our wine and view, an indoor tasting room and bistro if the weather isn’t ideal, and a new brick oven to prepare the best pizza at the Lake. We have added a Banquet and Event Hall available for your special occasion of groups up to 50. Golden Rock Winery: A casual atmosphere with wines made from the finest grapes sourced from vineyards around the world. Our restaurant menu is based on a green kitchen platform with a variety of appetizers, sandwiches, pizza, pasta – something for everyone ! Casa De Loco Winery: Whether you’re looking for an afternoon picnic spot, an evening glass of wine by candlelight, or a luxurious overnight stay to sweep the one you love off her feet, Casa de Loco is the perfect place to go. Romance and wineries go hand in hand and at Casa de Loco we are thrilled to go above and beyond to make your romantic getaway completely unforgettable!